Prepare for a fierce faceoff with these two opponents. 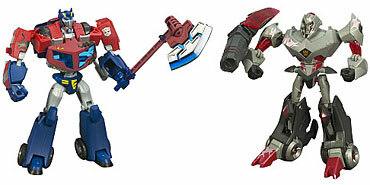 In robot mode, the mighty Optimus Prime figure is poised for challenge with his double-handed ion chopper, while the menacing-looking Megatron figure will be ready to resist, wielding a fusion launcher. Convert the Transformers launcher to a slicer for added excitement. Gear up for land versus air arena too, when you convert the action figures to Earth Truck and Cybertron Fusion in vehicle mode. Victory is within reach but who will claim it? You decide. Toy figures come with an exclusive DVD from the Transformers Animated series.